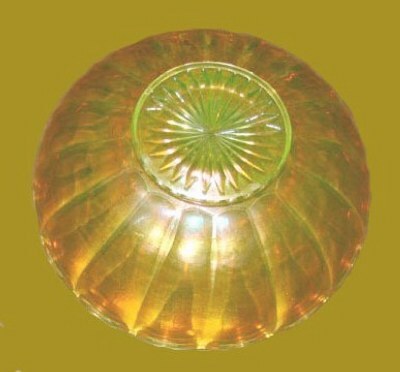 Presence of the first example having no plunger design, has instigated an extensive study into the derivations of this base mold “loosely referred to” as WIDE PANEL! 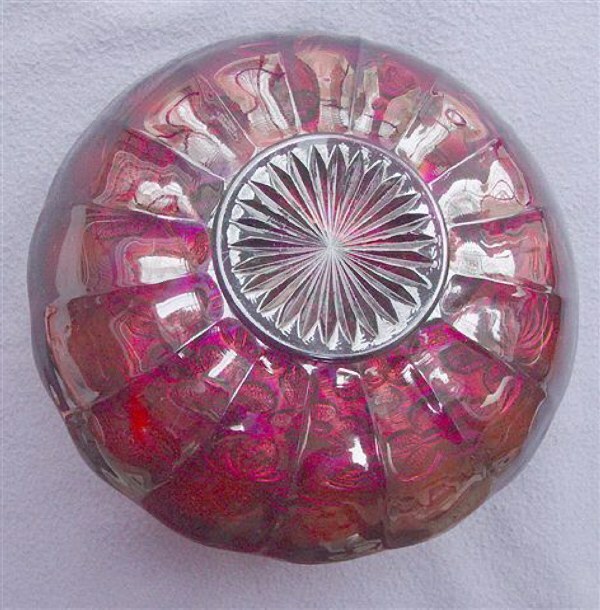 Two resounding factors of importance: Marie McGee did not delve extensively into the subject for her book on Millersburg Glass. I no longer ponder over that, for revealed here, is the fairly conclusive evidence of extravagance super-ceding sound business practice on the part of John W. Fenton! 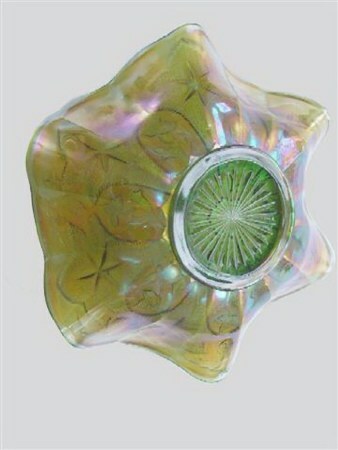 With more scrutiny pertaining to purchase of so many (Wide Panel) molds, he surely could have extended his business beyond the brief production of iridescent glassware. 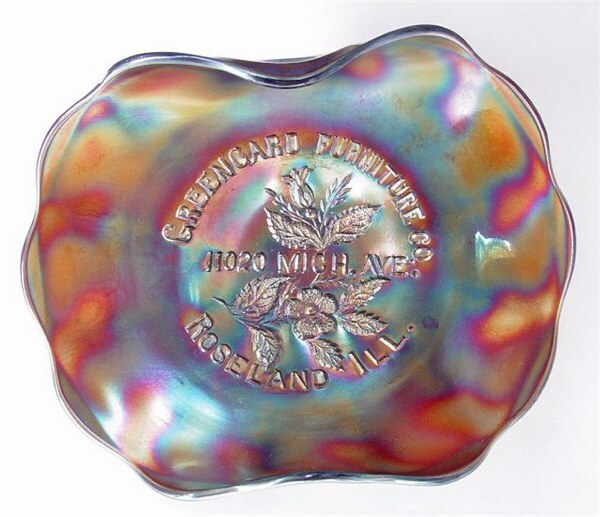 In early 1910, Millersburg Glass Co. put its first iridescent ware on the market. 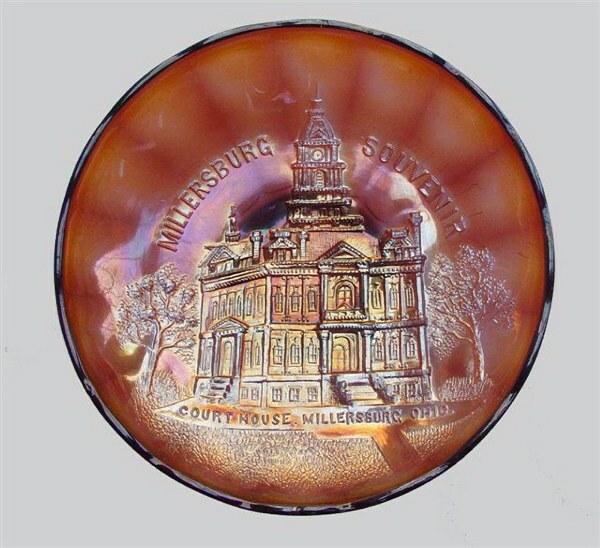 Hipkins Novelty Mould Co. began legal proceedings against Millersburg Glass Co. and John W. Fenton in August 1909, just four months after the plant had begun operations. Finally, on March 14, 1911, a verdict was rendered in Hipkins’ favor. (We received a quote of $20,000 from Island Mould Co. in the late 1980s for a San Diego Club Souvenir.) That price would hold, so long as there were no flaws found in the initial cast iron. Should they need to make corrections in a new mold, the price would increase!) This will offer some idea of the costs involved in this process of manufacture. Beyond that, costs of various snaps, plungers, retaining rings must be considered. Each different size marie’s require a different snap. For ruffles, saw-tooth edge and scalloped edge, each requires a different retaining ring. You can see very quickly how costs could become unmanageable! 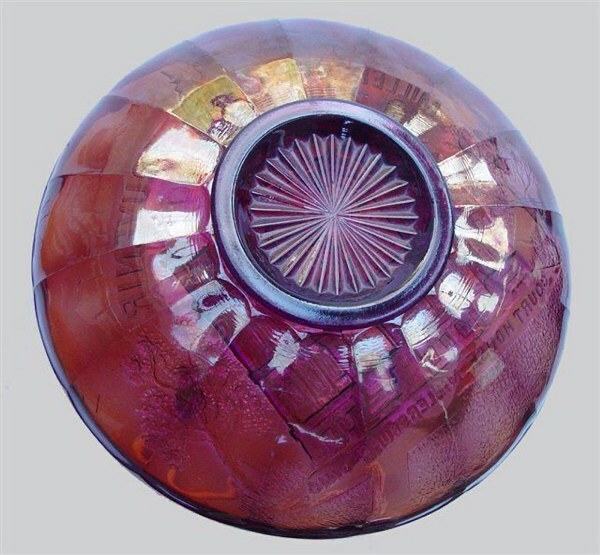 To cut costs, glass factories of long-standing have in-house machine mould shops. WIDE PANEL mold in Mlillersburg. Vaseline. 16 panels in this WIDE PANEL vaseline bowl. Courtesy Randy and Bo Jones. 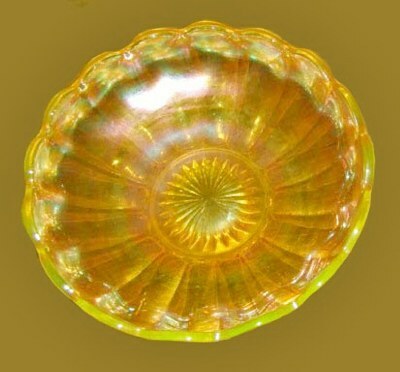 WIDE PANEL Vaseline Bowl: First-known basic mold bowl with no interior, reported in late Nov. 2010. It was found by Randy and Bo Jones of Millersburg, OH…………..and in Vaseline, yet! 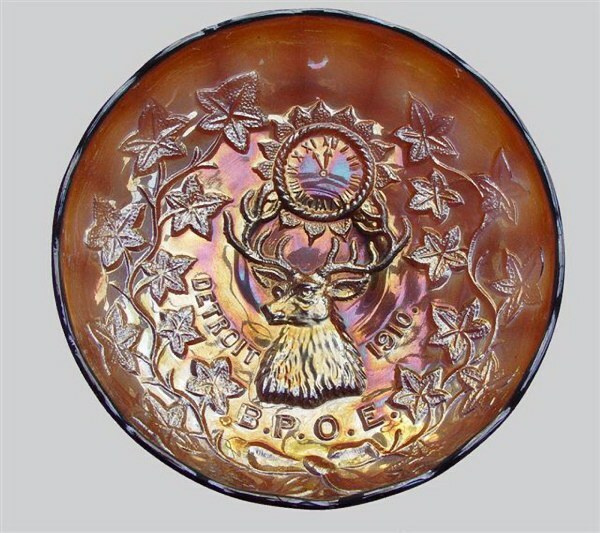 There are 16 panels with a 26 star point circular design within the marie, just as the Big Fish, Courthouse and Holly Sprig Variant and Elk bowls have. 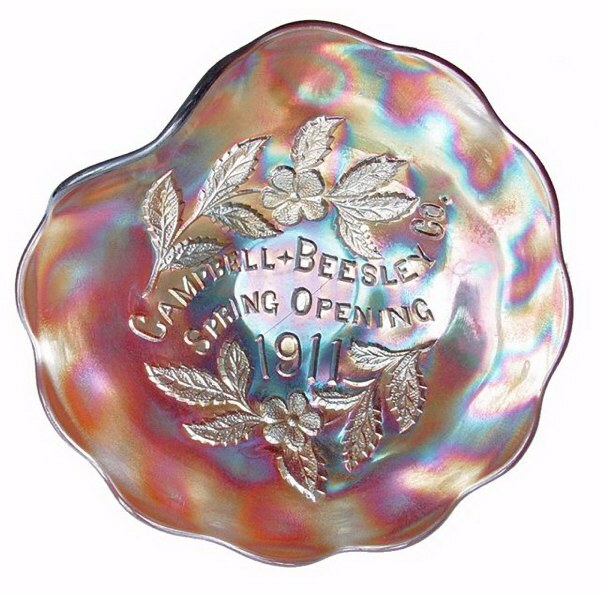 According to Marie McGee, the Wide Panel pattern was probably Millersburg’s #400 line, which was introduced as a crystal “colonial” style in Jan. 1910. 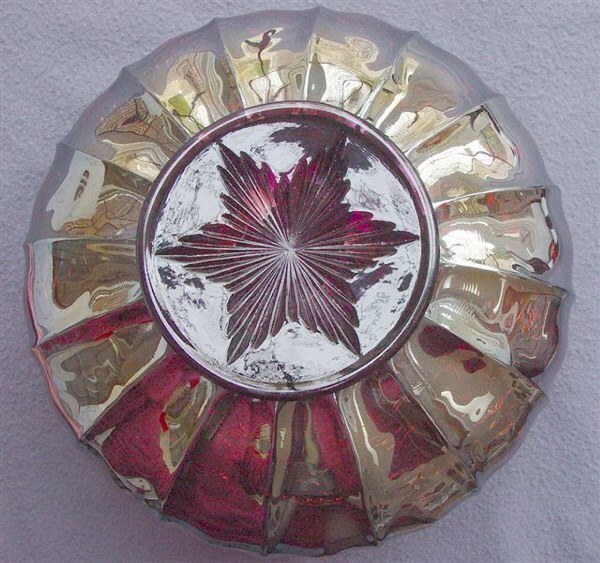 #400 Punch Bowls Radium (called Flute by Carnival glass collectors) are also listed. GREENGARD - 12 panels and 28 star points. CAMPBELL - BEASLEY - 12 panels and 28 star points. There are 12 panels on the small sauces, each having the same 28 star points design within the marie. Blackberry Wreath, H. Cherries, Peacock and Isaac Benesch. Of course the 6” plates in Blackberry Wreath and Hanging Cherries offer the same characteristics. Single handgrip Campbell & Beesley, along with our Greengard DHG, also have the same details. A milling machine index head allows the machinist to make a series of the same cuts as in the starred base of the marie. Bases on the small sauces/plates are 2 5/8” diameter. Elk has 16 panels and 28 star points. 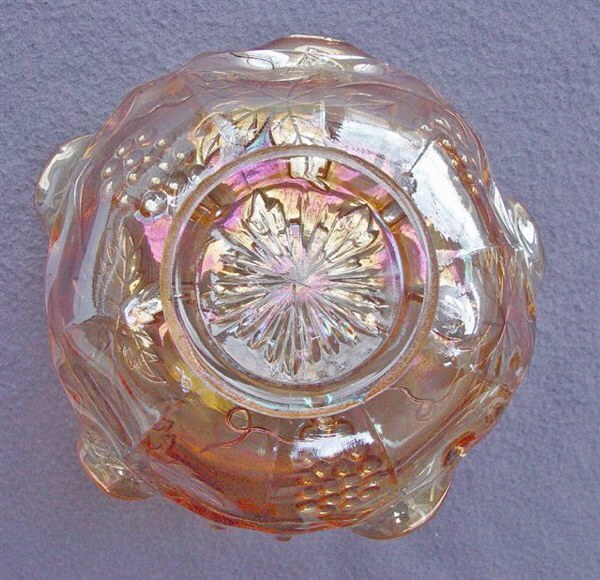 BIG FISH has 16 panels and 26 star points, just as the Vaseline bowl. Base is 3” in diameter. COURTHOUSE has 16 panels and 28 star points. 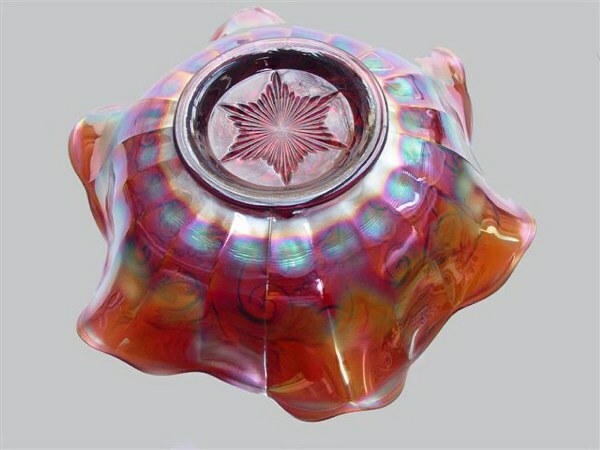 PEACOCK IC shape (8 7/8” diameter), has 16 panels, a large 6-point star on a 4” base. SEAWEED has 20 panels and a smaller 6-point star on a 4” base. It is 10 ¼” diameter. 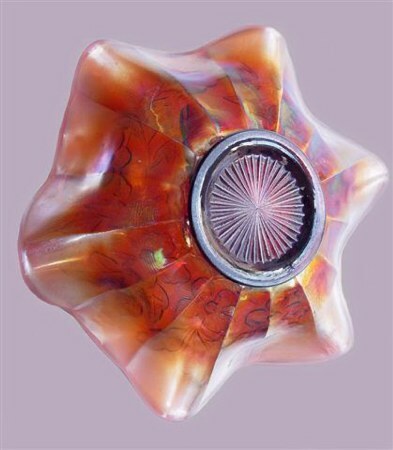 Right - TROUT & FLY has 15 panels, 36 star points, a 3 1/8” base and is 9 1/8” diameter. VINTAGE Variant sauce has only 10 panels, along with the smaller 6-point star.